Heya guys. 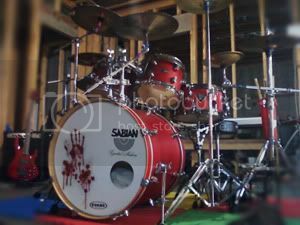 I recently aquired a floor tom that matches my set for a steal on ebay, along with another bass. Anyway, I was wondering, since the floor is the exact same size, is it going to be hard to tune it lower? I'd think since they're the same drum it'd be tought...any ideas? Hard to say without knowing the drum's size. I also have a Slingerland BR set-up with matching 16x16 toms (and I also now know why Buddy used the 2nd drum as a towel rack). 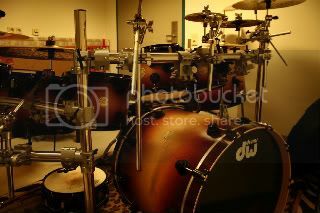 Each drum size has it's own tuning range. Go too low on the 1st drum, and you find yourself not having much to work with when you start to tuning the 2nd drum. I've tried to get by this issue myself by using a coated single ply top and bottom on the first tom, and then using a 2 ply head on top and single ply on the bottom of the second. It does seem to give me a little more in choices, but it's not perfect. I'm actually looking to remedy this issue this year by having a 15x15 made to match the kit, and then I'll loose one of the 16's. They're both 16x16, and I have them tuned up relatively high. Thanks for the input, having it up high should give me some room to screw around with. Tune one at the top of its range and the other at the bottom of its range. SGarrett wrote: Tune one at the top of its range and the other at the bottom of its range. Yup, I used to run 2 13 inch toms and did the same thing, worked pretty well. I have 2 16" x 16" floor toms on my Yamaha kit, and I just tune one high end, one low end. It's really not that hard, and doesn't require differing head selections, both have Evans G2 Clears for the batter and G1 clears for the resonant heads. Sounds awesome to me, and to most soundguys that I work with. Kieth Moon had all 13" racks and all 16" floors on his kit. In a way it makes sense to me as all the drum types(floor or rack) have all the same dimensional attributes matching them sonically but just in differents pitches. Anybody else done or tried this out? If you can't get the tuning right, how 'bout knocking one floor tom over and make it a small kick? I agree whole heartedly agree.